It took my about 30 minutes to finally to get this shot but I think it was well worth it. I started out with one light. A White Lightning 1600 gelled blur, bare bulb. I had to adjust the power and distance to get it just right. I then added a directional font light. An Alien Bee 800 inside of a gridded softbox, camera right. I got the exposure right on both of them but I thought the image still lacked drama. I then added the home made gobo in front of the backlight which helped a bit but the real drama started when I turned on the fog mahcine. The combination of gelled blue backlight and fog really worked well with the gobo. 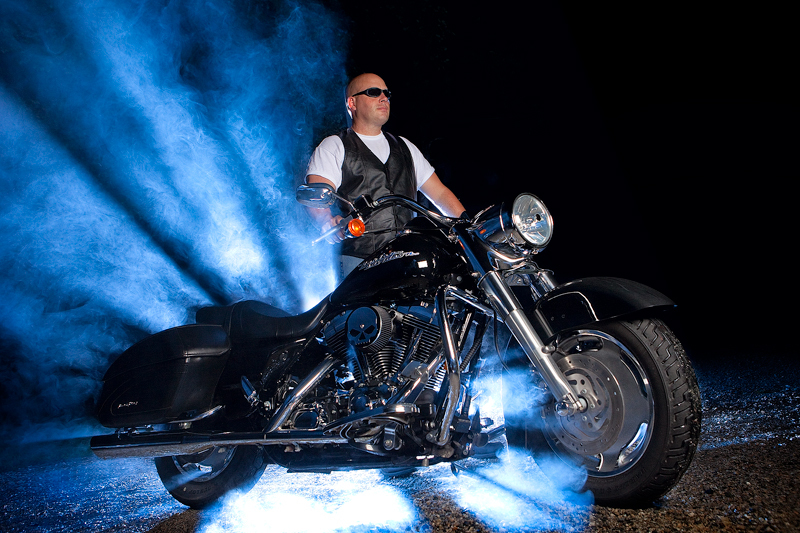 The light spread into rays, castint through the fog and parts of the bike making for an image I was proud of.